Got 30 minutes? You should probably use that time to make this roasted garlic gluten free naan because it is the stuff your gluten free dreams are made of! I have been mixing and matching naan flavors for the last few weeks and let me tell you – I’m in love! 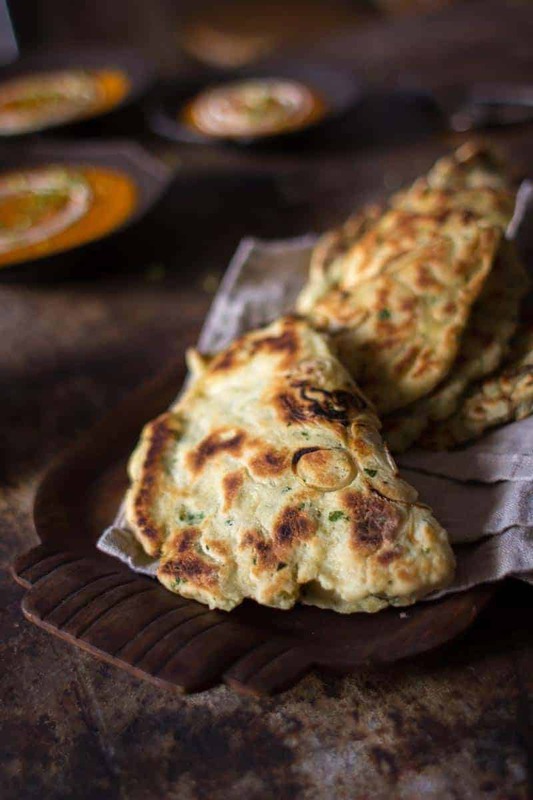 This naan is perfectly chewy on the outside while being soft and tender on the inside. It’s a weeknight warrior that you need to have in your repertoire! In a separate mixing bowl combine the rice flours, cornstarch, potato starch, xanthan gum, salt and baking powder. Whisk well. To the yeast mixture add the roasted garlic paste, buttermilk and olive oil. Whisk well to combine. Add the wet ingredients to the dry ingredients and stir to combine with a rubber spatula. The mixture will be thick and shaggy, a lot like mashed potatoes. Set aside to rest for 20 minutes. Heat a cast iron skillet or griddle over medium high heat. Lightly dust a clean, flat surface with potato starch. Scoop out 1/4 – 1/3 cup-fulls of dough onto the surface. Roll gently in the potato starch then press out into a flat round disc with the palm of your hand. Complete with the remaining dough. Melt a small pat of butter in the pan then one at a time place a round of dough onto the hot pan. Starting in the center of the dough quickly use your finger tips to press dimples into the surface of the dough and cook for 2 minutes – 2 1/2 minutes then flip an cook another 2 minutes. Depending on how hot your griddle is you may need to add a minute or two to the cook time to ensure that the naan is as golden as desired. To make the crispy shallot naan: Omit roasted garlic. Scatter very thinly sliced rings of shallot into the melted butter in the frying pan before placing the naan bread on top.